Ever since I made my Healthier Chocolate Hazelnut Spread I have been trying to think of ways to use this decadent spread. For Valentine’s Day I made raspberries stuffed with the Healthier Chocolate Hazelnut Spread. They were a delicious little nibble. I liked that flavor combination so much I have thinking of a way to incorporate them into a snack bite for my client. 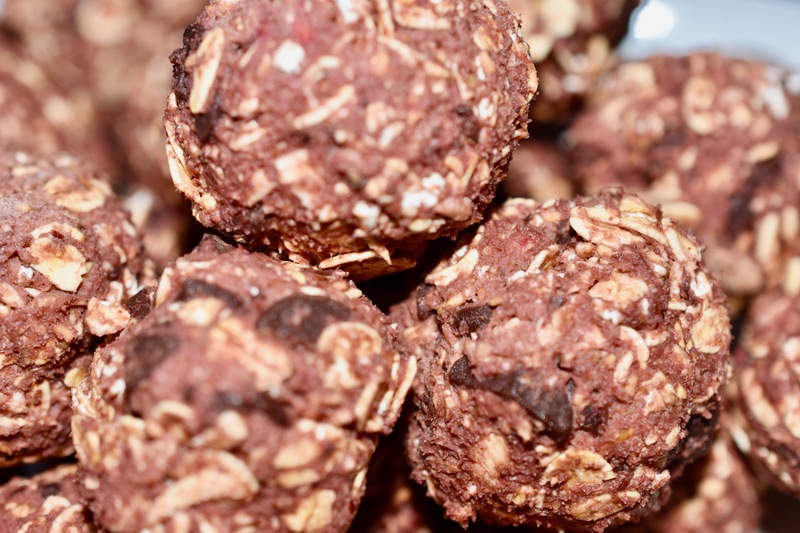 I did it with these Raspberry Chocolate Hazelnut Bites. They are truly decadent and delicious. They freeze well, so whenever you want a little treat you can pull one out of the freezer and indulge. Stir in the oats and chocolate chips into the raspberry mixture. The dough should be stiff. Roll the dough into walnut size balls. Freeze the bites for about 30 minutes to firm up. Yum!! These are going on the list this week. We have been in a rut with our healthy snacks. Hi Kris. I hope you enjoy them as much as we do. Thanks for stopping by Cathryn’s Kitchen.